Huge yellow flower heads, which are feathered with a rich red and open early. Also called peony tulips named because of the double flowers that you see on peonies. Freeman has huge yellow flower heads which are feathered with a rich red and open early and last longer than many other varieties. 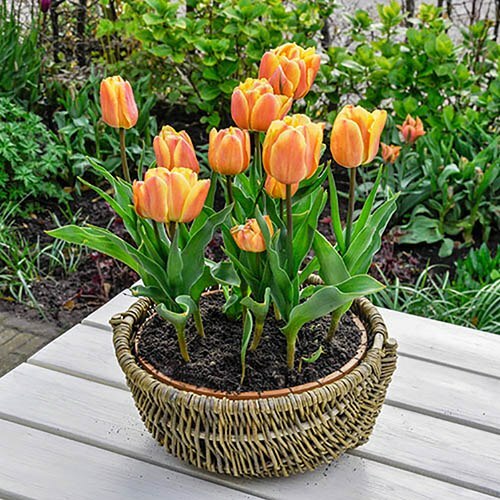 Tulips are one of the most popular bulbs, as they are great planted with many different colour variations to give a fresh, vibrant spring colour to your garden, patio or decking. They also make great cut flowers to brighten up the house. Double tulips for their heavy flowers slightly more vulnerable to wind, so choose a sheltered spot. Plant in autumn for stunning spring displays.